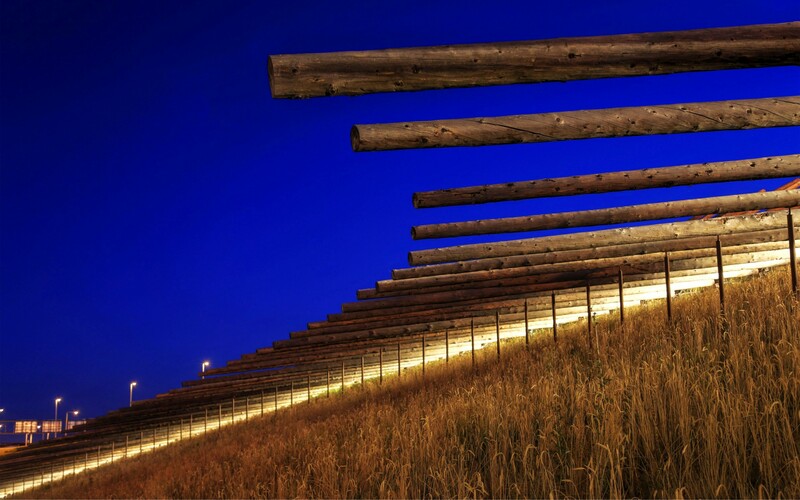 Patrick Marold Design Studios used Lumenbeam Large fixtures to create subtle lighting schemes for the large-scale timber design art installation in Denver. The true game-changer for us was Lumenpulse’s Lumentalk technology. 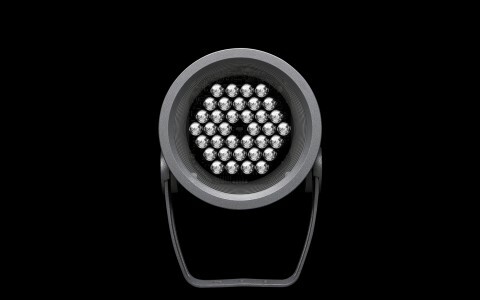 Having individually controlled fixtures without all that extra wiring helped us expand the possibilities. Lumentalk helped create the intended choreography of light. 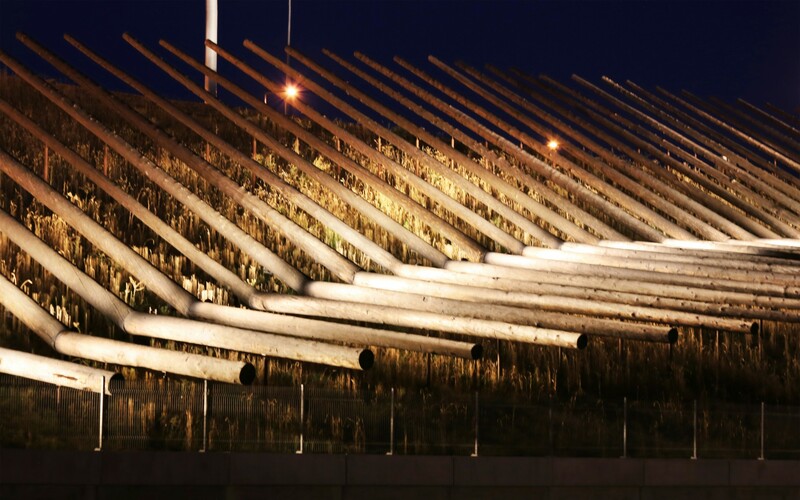 Shadow Array is a large-scale timber design art installation consisting of 236 beetle-kill spruce logs from Colorado. 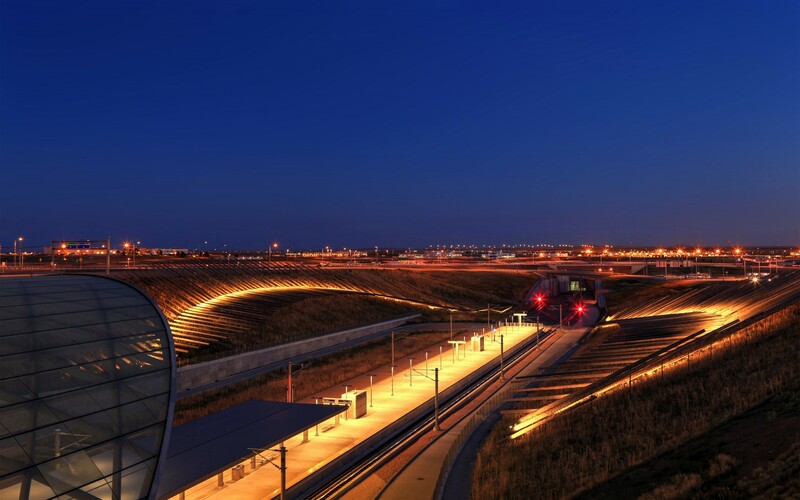 As part of the Denver International Airport South Terminal redevelopment, the city of Denver commissioned Patrick Marold Design Studios to create an art installation that would welcome travelers entering and exiting the valley by train and offer a scenic panorama for hotel guests. 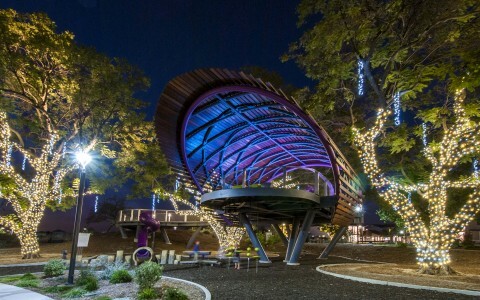 "Our goal with the lighting scheme was to create an engaging installation that showcased the relationship between the night sky and this enormous valley," says Marold. 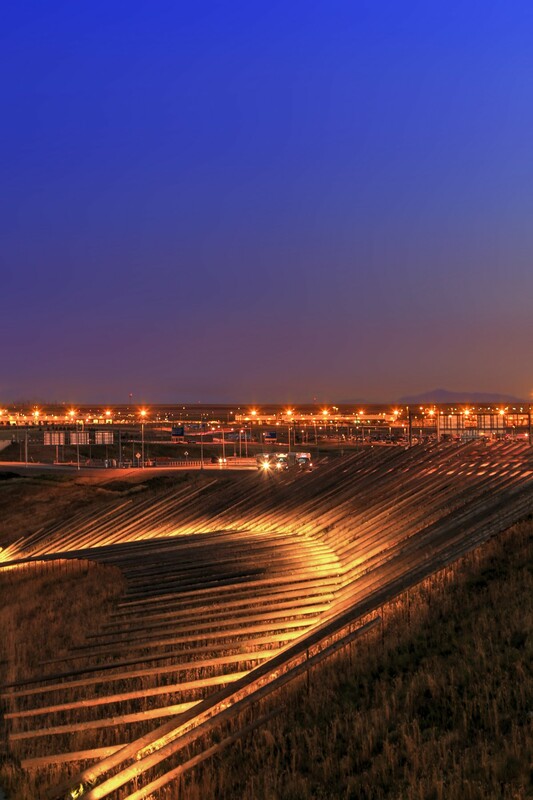 To accomplish this, Marold developed a subtle lighting scheme that references tidal movements, subtly coming in to the north, flooding the valley with light and going back out. 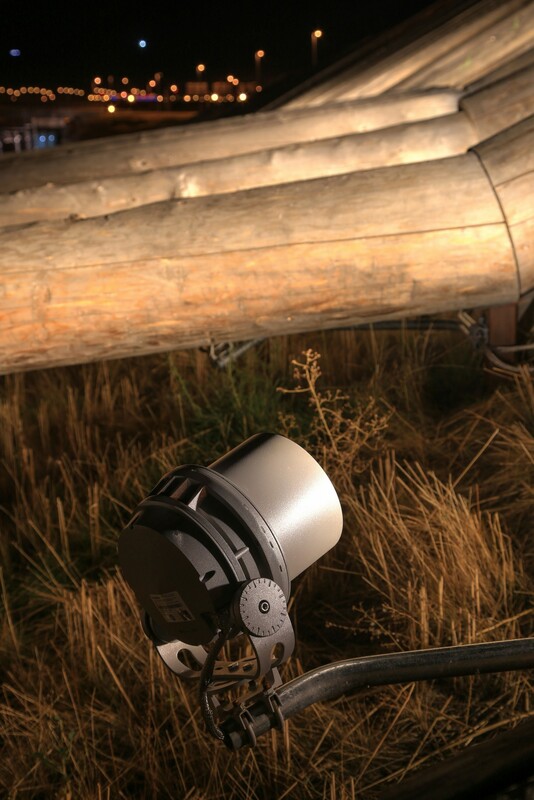 Lumenbeam Large fixtures with linear spread lenses were installed at the logs' junction points, discreetly hidden from the predominant views. From dusk until dawn, the programed light schemes create delicate differences in the warm white lighting. 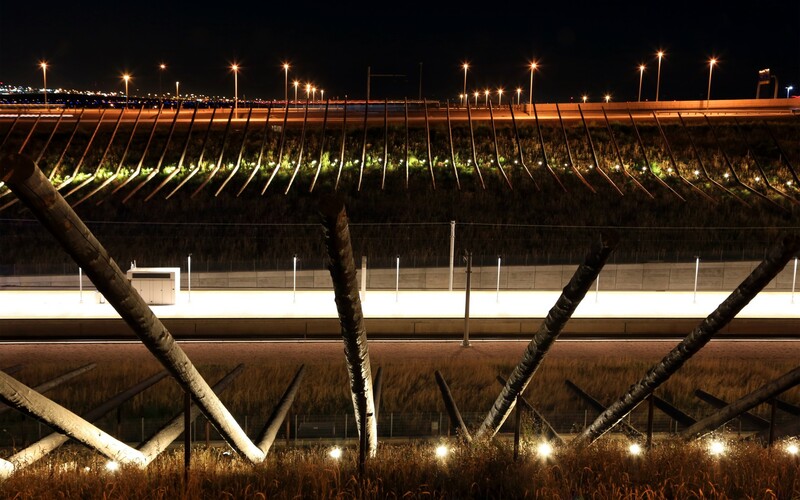 During twilight hours, the lower portion of the logs are lit, while in the late evening hours, the lighting effects will shift to the upper half,'' he says. 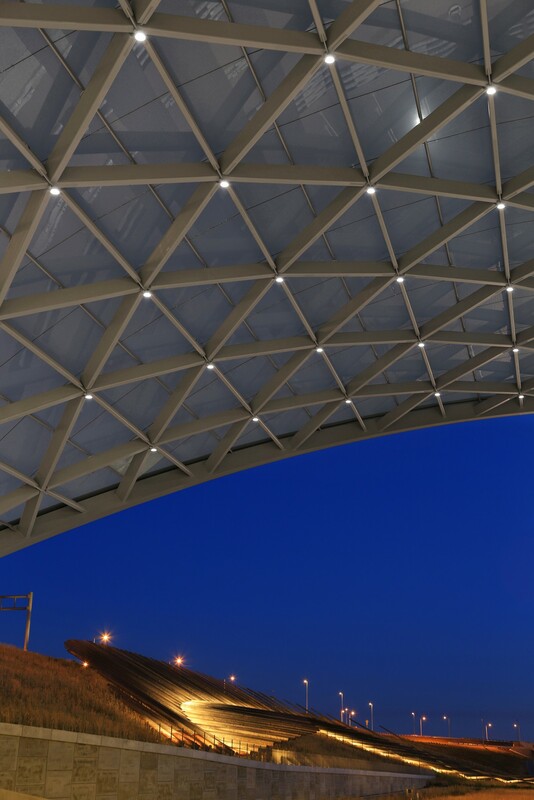 "Lumenpulse's Lumenbeam fixtures were our immediate choice thanks to their superior quality of light and strong output," says Marold. "The spread lens helped lengthen the beam of light to adequately flood the log." 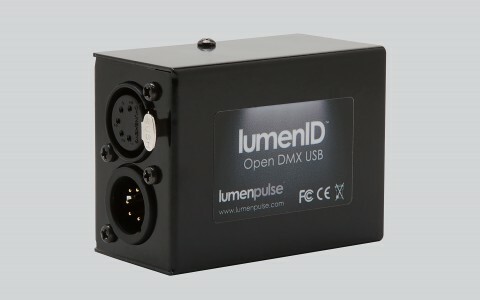 "The true game-changer for us was Lumenpulse's Lumentalk technology," says Marold. 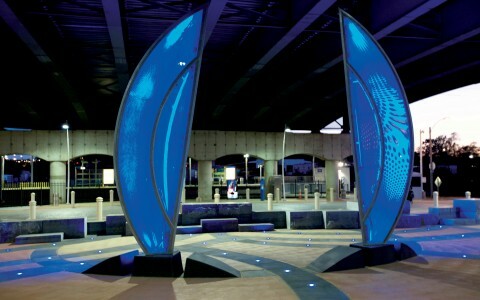 "The rhythmic and dynamic movement was at our design's core. Having individually controlled fixtures without all that extra wiring helped us expand the possibilities. Lumentalk helped create the intended choreography of light." Lumenpulse's Lumentalk is a patented technology that enables digital control of LED lighting over existing AC power lines, thus eliminating the need for extra data wiring. The option for 270V lights also allowed Marold and his team to decrease our wire gages considerably, a major consideration with a system spanning over 700 feet in length. 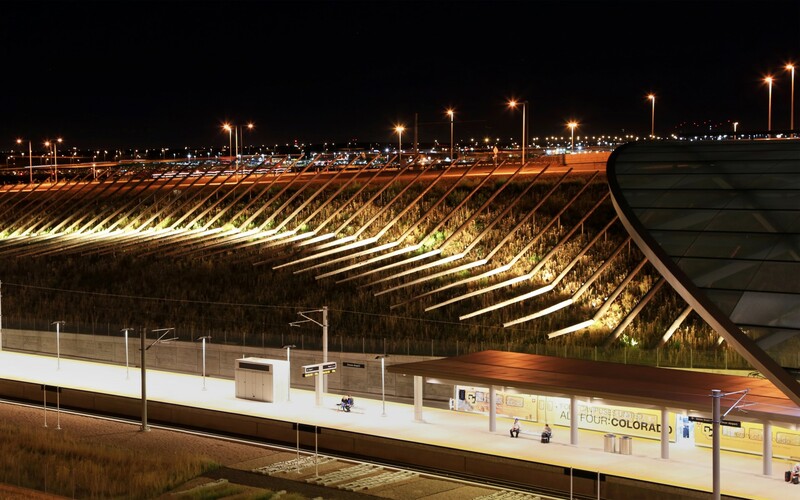 The result is a dynamic lighting system that catches the eye from all levels. 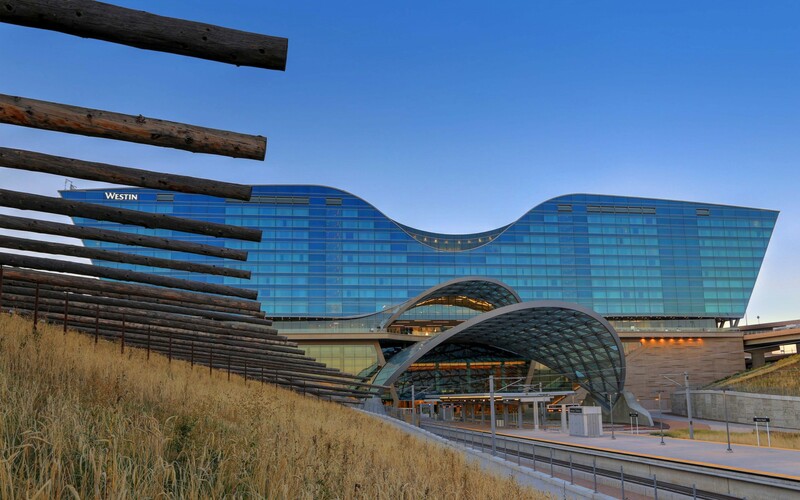 "We've had great feedback from everyone - people that are staying at the hotel, coming in on the trains and even those flying in at night," says Marold. "It has such a distinguishable pattern and warm quality of light - it stands out in the valley." 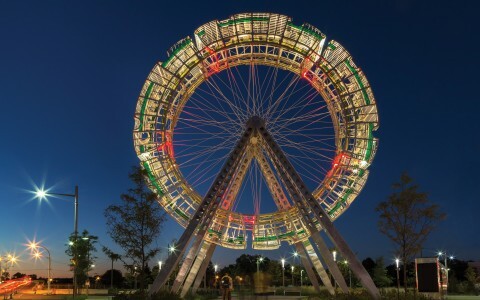 Note: The installation was recently awarded the CODA awards Prize for Best Landscape Project. 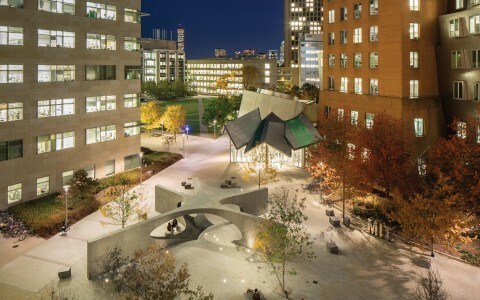 The CODA awards celebrate design projects that demonstrate the most successful integration of commissioned art into an interior, architectural, or public space. For details, please visit the CODA website.